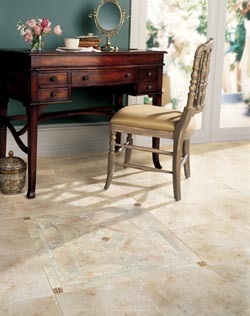 Transform any room in your home or place of business into a stunning showplace with our selection of tile flooring. Our expansive showroom features a broad selection of stylish and durable ceramic, porcelain, and slate tile flooring that adds timeless appeal and modern comfort to any room you are renovating. Whether you are redesigning the shower tile in your home, or creating a new atrium for your business, our selection of tile helps you create a distinctive look. In addition to the beauty and appeal of tile, this type of flooring also features a level of durability that is difficult to match. Choose the right style of tile for your family’s lifestyle when you work with one of our friendly and knowledgeable sales specialists. We take the time to listen to your needs, so you get the flooring product that best suits your needs in looks, performance, and price. Our 12 month finanacing options can help you keep your budget low. Invest in flooring that will retain its color and finish for years to come. If you have a household that’s active with children and pets, you need a surface that can withstand the scratches and stains that come from heavy amounts of traffic. You also don’t have the time to spend endlessly caring for your new flooring. Our ceramic tile floors provide you with a resilient surface that is easy to clean with just warm water. Protect your children and loved ones from the harmful effects of traditional cleaning agents by investing in our tile floors. Ceramic tile has been used for centuries due to the versatility it provides. This type of tile is easier to cut, and allows a broader range of patterns and applications. Modern ceramic tile flooring has become one of the most flexible options in flooring, providing a wide range of colors and styles at a price-per-square-foot to match any budget. Get more out of your flooring investment by working with our ceramic tile. Although ceramic and porcelain are similar products, ceramic allows you greater versatility when it comes to pricing and fit. This affordability allows you to expand your design horizon and work with a wider range of colors that better fit your budget. Porcelain tile flooring is the perfect foundation for your active family life. This resilient type of tile flooring resists moisture, and is perfect for both exterior walls and interior flooring. Like ceramic tile, our porcelain flooring is easy to clean. All you will need to clean your flooring is just some warm water and a sponge. The color of your floors will stand the test of time, and any chip in this tile will maintain the surface color. Invest in a flooring product that can withstand the pressures of your active lifestyle for years to come. When you are in the market for a natural flooring tile that can withstand water and stains, then our slate tile is a perfect alternative. This tile made from natural materials is perfect for both kitchens and bathrooms. The stain-resistant surface will be easier to clean, and the timeless look just can’t be beat. Slate flooring is suitable for a wide array of settings, and looks great in both commercial and residential settings. The broad variety of textures help you create a surface that is unlike anything you have ever seen, and your new floor will have the strength of concrete. When you want the natural look of hardwood floors in a room that experiences heavy levels of moisture or sun exposure, take advantage of the authentic look provided by wood look tile. With this tile product you never have to worry about scratches and moisture damage. Getting the best fit in your favorite room is also easier with wood look tile. Unlike hardwoods, this product won’t suffer the expansion and contraction that comes with the changing seasons. This stunning, natural looking option opens up the design possibilities to every room in your home. When you are sick of a dull and dingy shower, start creating a whole new look and feel with our selection of shower tile. With so many options for color and texture, the only limit to your creativity is your imagination. These tiles will withstand the effects of daily moisture, and they are easy to clean as well. Your shower will become more enjoyable to use when you create an original design pattern with our tiles. Although we make it easy to purchase tile for your own home improvement project, there is no better way to protect your flooring investment than getting your tile flooring installation from our team of professionals. You need a precise cut to get the right fit in your home, and you could avoid needless repair costs in the future by choosing this option. Our complete approach to your satisfaction is evident from the time you first walk into our showroom. We carry this commitment all the way to the first step you take on your new floors. Our team is committed to delivering the best installation job possible. We take the time to listen to your needs, and we aim to completely satisfy your wants. Start your design journey by visiting us today. Contact us today for a free estimate on the tile flooring you have always dreamed of. We proudly serve the communities of Painesville, Lake County, Mentor, Concord, and Willoughby, OH.